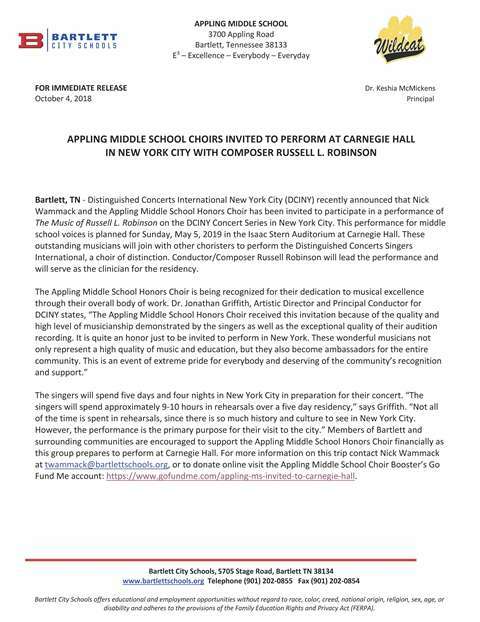 Appling Middle School has been invited to perform at Carnegie Hall as part of the DCINY Concert Series featuring the music of Russell Robinson under the baton of composer/conductor Dr. Russell Robinson. This invitation is due to the exceedingly high quality of the group and the exceptional direction of Nick Wammack. Donations are needed and appreicated for this once-in-a-lifetime opportunity. By contributing, you enable these talented young people to perform in one of the most prestigious concert halls in the world. Please contact Nick Wammack at twammack@bartlettschools.org to arrange your donation. Below is a news release with more information.